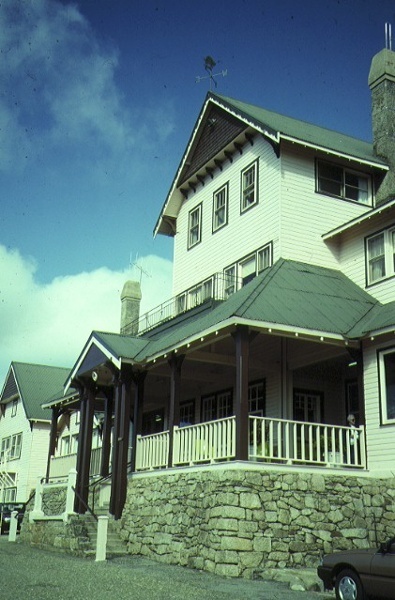 The Chalet was built at Mount Buffalo after the first road to the summit was opened in 1908. The first Europeans recorded the Buffalo plateau in1824 and the tourist potential gained impetus in the 1880s. The latter increased the government?s interest in the alpine area and, as a result, an area of the plateau was temporarily reserved as a National Park by the government in 1898. This area was increased in 1908 and the intention to construct a Chalet on the summit announced. Originally intended to be built of granite, the timber Chalet was designed by the Public Works Department as a temporary building, completed in 1910 and leased to Mr J Newton. Its popularity was immediate and in 1912 it was described as the epitome of luxury, with large sitting rooms, ample fireplaces, well ventilated bedrooms and hot and cold baths. Improvements were made soon after construction and these included a golf links in 1911, a north wing addition in 1912 and a south wing and billiard room in 1914. In 1919 the new lessee, Miss Hilda Samsing, lobbied the government to make improvements to such amenities as heating and lighting, while in 1921-22, an addition to the south wing increased bedroom and bathroom facilities. The billiard room was moved to the front of the house and the terraced garden, with rubble granite retaining walls, was laid out at the front of the chalet. In 1924 the management of the Chalet was transferred to the Railways Department and the facility was operated in a formal manner, including the issuing of standard railway tickets for all activities and the wearing of railway uniform by the porters. A service providing motor coach transport for guests from Porpunkah railway station to the Chalet commenced in 1925. This was maintained until the passenger train service on the Bright line was discontinued in 1952, and guests were then transported by motor coach from Wangaratta. Further improvements were made to the Chalet in 1925-26, when the present dining room, the kitchen and billiard room wings were constructed, and the original dining room was converted to a ballroom, with a stage. Balustrading along the front of the building was removed and large windows inserted to provide uninterrupted views. In 1937-8 major alterations were made with the extension of the south wing and a second storey added to the central wing of the building. At this time the provisions for 200 guests at the Chalet was noted as more than equalling the best city hotels. During the war there was a reduction of both staff and clientele at the Chalet, and servicemen and women on leave were given priority in bookings. After the war, migrants and displaced persons from Europe, many of them Jewish, found the Chalet to be a comforting reminder of their homelands. The Railways Department managed the Chalet until 1985 when the government took over its running, under the auspices of the Tourist Commission. In 1993 it was leased privately again and has continued to provide accommodation, despite the post-war development of alpine resorts by private enterprise at other locations. Reminiscent in style to northern European Chalet architecture, the Mt Buffalo Chalet is a bungalow style, timber building on a coursed random rubble plinth, with a series of hipped and gabled corrugated iron roofs. Originally designed as a symmetrical, gabled roof building, early additions were carried out in a similar style and continued the symmetry of the front facade. The second storey addition to the central wing altered the appearance of the building, however the bungalow character was retained. Slender rough cast render chimneys with tapering tops and random coursed rubble bases; a decorative barge board over the main entry; decorative timber brackets supporting timber shingled, gable ends; exposed rafters and double hung, paned windows all add to the character of the building. Internally, some remnants of decoration remain, reflecting various stages of the Chalet?s development. The Chalet is sited amongst granite outcrops and is surrounded by well manicured gardens. Simple, utilitarian outbuildings, including a garage, engine room, firewood store, carpenters? shop, stables and tractor shed, were constructed before 1940 and remain on the site. Mt Buffalo Chalet is of architectural, historical and social significance to the State of Victoria. Mt Buffalo Chalet is of architectural significance as one of the largest chalet complexes in Victoria. Its isolated location has prevented the intrusion of later developments, usually associated with alpine resorts. The consistency of the style in the development of the main building, particularly over the first 30 years, the domestic scale and character imparted by the bungalow style, and the retention of pre-1940 outbuildings add to the Chalet's importance. 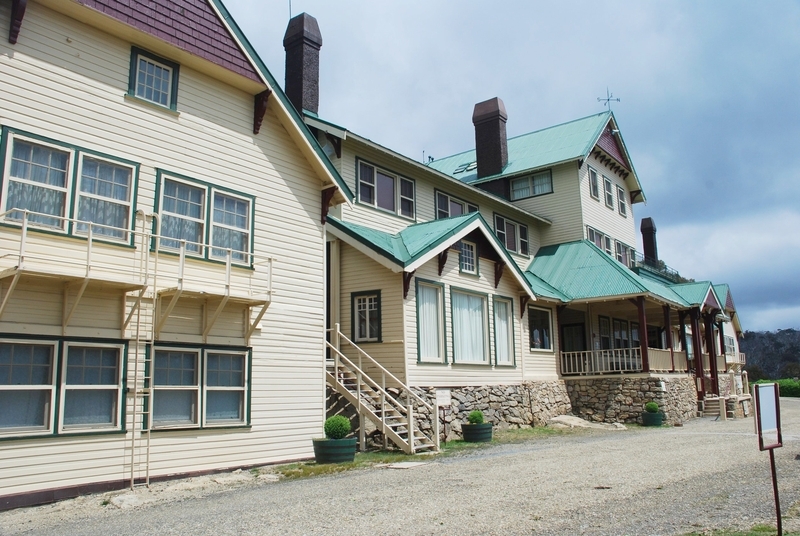 Mt Buffalo Chalet is of historical significance for its association with the history of leisure in Victoria and the development of the Mt Buffalo National Park, and for its provision of an environment which has remained relatively unchanged since its construction in 1910. Its continual operation as a government-run tourist destination for over ninety years, and its association with the Victorian Railways from 1924, with its unique way of operating such a facility, are of importance. 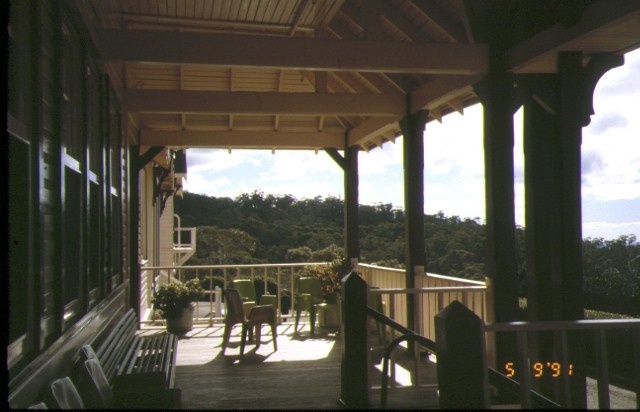 Mt Buffalo Chalet is of social significance due to its association with a section of the community in their pursuit of recreation. It played a part in promoting the development of the Mt Buffalo National Park as a year round alpine resort for a broad cross section of the community. 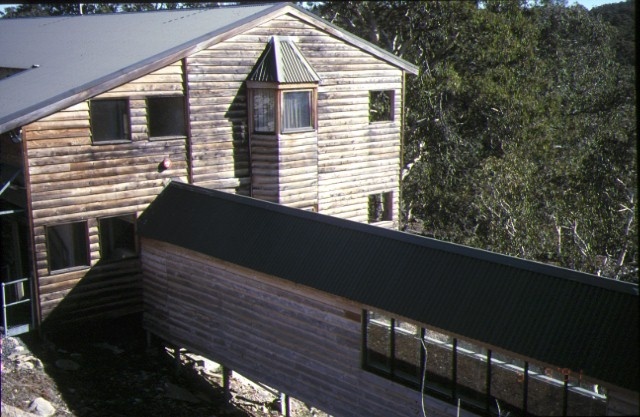 Mount Buffalo Chalet, Mount Buffalo National Park, Shire of Bright. 1. The buildings known as Mount Buffalo Chalet including the main building; the Chalet garage; the engine room; the firewood store; the carpenter's shop; the stables; the tractor shed; the lock-up garages; and the staff amenities building marked respectively B-1; B-2; B-3; B-4; B-5; B-6; B-7; B-8 and B-9 (but excluding the Communications Towers and Sheds No. 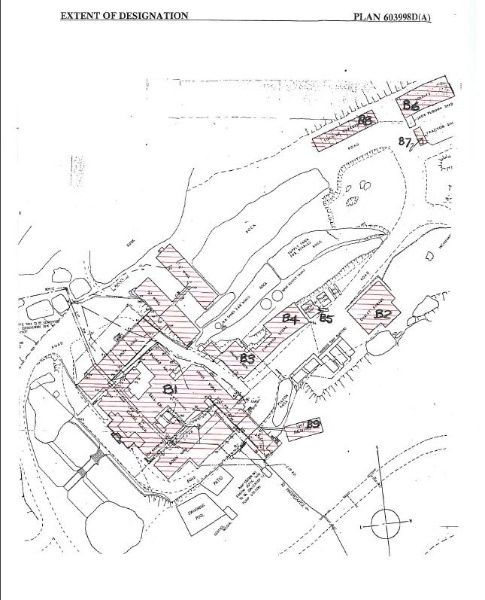 1 and 2, the pump house, the swimming pool, the tennis courts, the staff quarters), as shown on Plan No. 603998D(A) endorsed by the Chairperson, Historic Buildings Council and held by the Director, Historic Buildings Council. 2. 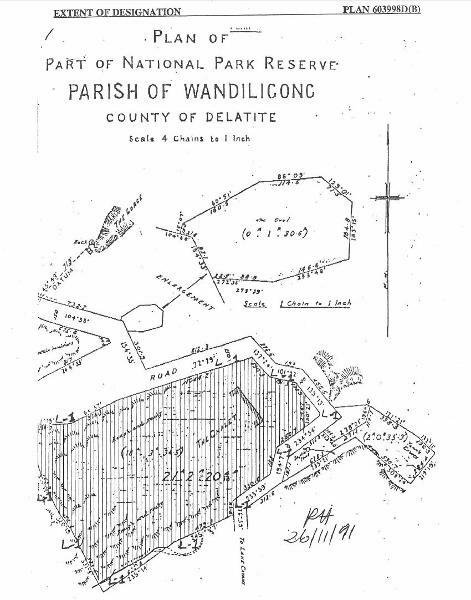 The land part of the National Park Reserve known as Mount Buffalo National Park, and more particularly Part 17 of Schedule 2 of the National Parks Act 1975, in the Parish of Wandiligong, County of Delatite shown hatched and marked L-1 on Plan No. 6039980(B). 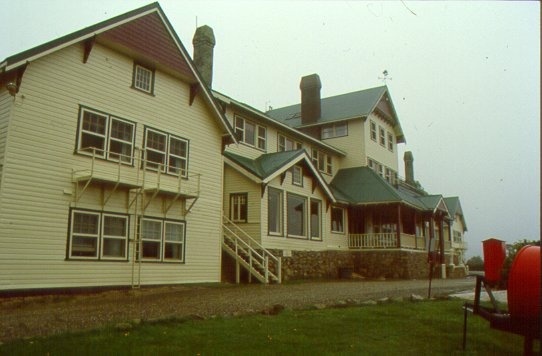 The Chalet was built at Mount Buffalo after the first road to the summit was opened in 1908. The first Europeans recorded the Buffalo plateau in1824 and the tourist potential gained impetus in the 1880s. The latter increased the government’s interest in the alpine area and, as a result, an area of the plateau was temporarily reserved as a National Park by the government in 1898. This area was increased in 1908 and the intention to construct a Chalet on the summit announced. · Renovations to the cafe and conversion of room 106 into a shop in accordance with the six A4 documents submitted which have been endorsed by the Executive Director. · Painting or wallpapering of previously painted walls and ceilings in the cafe or shop provided that preparation or painting does not remove evidence of earlier paint or other decorative scheme. Evidence of earlier schemes should be reported to Heritage Victoria. · Removal of paint from original unpainted or oiled joinery, doors, architraves, skirtings and decorative strapping. · Replacement of carpets and floor coverings. · Removal or replacement of curtain tracks, rods, blinds and other window dressings. · Installation, removal or replacement of hooks, nails and other devices for hanging of mirrors, paintings and other wall mounted art works. · Removal and replacement of existing benches and fixtures including sinks, stoves, ovens, refrigerators, dishwashers etc and associated plumbing and wiring to kitchen areas. · Installation, removal or replacement of electrical wiring provided that all new wiring is fully concealed and any original light switches, pull cords push buttons or power outlets are retained in-situ. Note: if wiring original to the place was carried in timber conduits then the conduits should remain in-situ. · Installation, removal or replacement of smoke detectors and security alarms. 1. All original fabric removed such as windows, doors, timber wall panelling, architraves and skirtings are to be stored safely on site for future reinstatement. 2. Exempt classes of works or activities are to be planned and carried out in a manner which prevents damage to the registered place / object. However, if other previously hidden original or inaccessible details of the object or place are uncovered, any works that may affect such items shall immediately cease. The Executive Director shall be notified of the details immediately to enable Heritage Victoria representatives to inspect and record the items, and for discussion to take place on the possible retention of the items, or the issue of a modified approval. 3. If there is a Conservation Policy and Plan approved by the Heritage Council or Executive Director, all works and activities shall be carried out in accordance with that Policy and Plan. 4. Nothing in this Declaration prevents the Executive Director from amending or rescinding all or any of the permit exempt alterations provided work has not commenced on the alteration. THE ATTENTION OF THE OWNER AND/OR APPLICANT IS DRAWN TO THE NEED TO OBTAIN ALL OTHER RELEVANT PERMITS PRIOR TO THE COMMENCEMENT OF WORKS. General Conditions: 1. All exempted alterations are to be planned and carried out in a manner which prevents damage to the fabric of the registered place or object. General Conditions: 2. Should it become apparent during further inspection or the carrying out of works that original or previously hidden or inaccessible details of the place or object are revealed which relate to the significance of the place or object, then the exemption covering such works shall cease and Heritage Victoria shall be notified as soon as possible. Note: All archaeological places have the potential to contain significant sub-surface artefacts and other remains. In most cases it will be necessary to obtain approval from the Executive Director, Heritage Victoria before the undertaking any works that have a significant sub-surface component. General Conditions: 3. If there is a conservation policy and planall works shall be in accordance with it. Note:A Conservation Management Plan or a Heritage Action Plan provides guidance for the management of the heritage values associated with the site. It may not be necessary to obtain a heritage permit for certain works specified in the management plan. General Conditions: 4. Nothing in this determination prevents the Executive Director from amending or rescinding all or any of the permit exemptions. General Conditions: 5. Nothing in this determination exempts owners or their agents from the responsibility to seek relevant planning or building permits from the responsible authorities where applicable. Minor Works : Note: Any Minor Works that in the opinion of the Executive Director will not adversely affect the heritage significance of the place may be exempt from the permit requirements of the Heritage Act. A person proposing to undertake minor works must submit a proposal to the Executive Director. If the Executive Director is satisfied that the proposed works will not adversely affect the heritage values of the site, the applicant may be exempted from the requirement to obtain a heritage permit. If an applicant is uncertain whether a heritage permit is required, it is recommended that the permits co-ordinator be contacted.